Stanley Kubrick’s “Barry Lyndon” is almost aggressive in its cool detachment It defies us to care, it forces us to remain detached about its stately elegance. Many of its developments take place offscreen, the narrator consistently tells us what’s about to happen and we learn long before the film ends that its hero will die poor and childless. This news doesn’t much depress us, because Kubrick has directed Ryan O’Neal in the title role as if he were a still life. It’s difficult to imagine such tumultuous events whirling around such a passive character. And yet the film has the arrogance of genius. Never mind how much it cost, how many years it was in the making. How many directors would have Stanley Kubrick’s confidence in taking this mass of historical fact and fiction, this ultimately inconsequential story of a young man’s rise and fall, and realizing it in a style that absolutely dictates our attitude toward it? We don’t just see Kubrick’s movie, we see it in the frame of mind he insists on -- unless we’re so closed to the notion of directorial styles that the whole thing just seems like a beautiful extravagance. what’s compulsive is his conviction that we do all tick. With “Barry Lyndon,” based on a novel by Thackeray, he has a very nearly ideal subject for the exploration of this theme. His hero is a young man that things happen to Barry seems to exercise little conscious control over his life. He falls into a foolish adolescent love, has to leave the district suddenly after a duel, enlists almost absentmindedly in the British Army, fights in Europe, deserts from not one but both sides, falls in with influential and unscrupulous companions, marries a woman of wealth and beauty and then destroys his own world because he lacks the character to survive in it. And all of these things seem accidental there’s no reason why they must happen, no theory of life or character that drives the hero to his end. No theory, that is, within Barry Lyndon’s life. But Kubrick examines that life as if through the wrong end of a telescope, seeing it in microscopic clarity. He has the confidence here of the great 19th Century novelists, authors who stood above their material and accepted without question their right to manipulate and interpret it with omniscience. Kubrick has appropriated Thackeray’s attitude -- or Trollope’s or George Eliot’s. Barry Lyndon, falling in and out of love and success, may see no pattern in his own affairs, but the artist sees one for him. 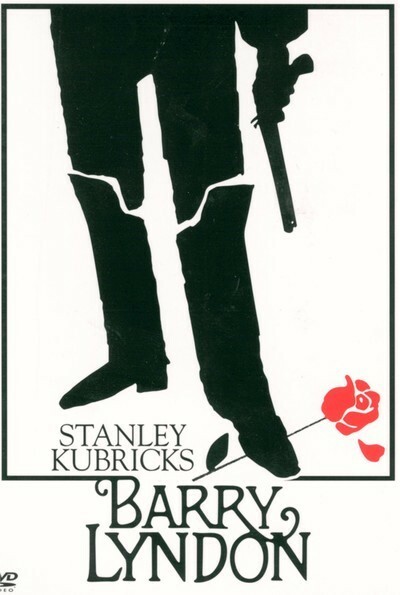 Perhaps Kubrick’s buried theme in “Barry Lyndon” is even similar to his outlook in “2001: A Space Odyssey.” Both films are about organisms striving to endure and prevail -- and never mind the reason why. The earlier film was about the human race itself; this one if about a rather minor, selfish, modestly pleasant example of it. There’s a sense in both films that a superior force hovers above these struggles, sometimes taking an interest. In “2001: A Space Odyssey,” it was a never-clarified form of greater intelligence. In “Barry Lyndon,” it’s Stanley Kubrick himself, standing aloof from the action by two distancing devices: the narrator, who deliberately destroys suspense and tension by informing us of all key developments in advance, and the photography, which is a succession of meticulously, almost coldly, composed set images. This must be one of the most beautiful films ever made, and yet the beauty’s not in the service of emotion, it’s disdainful of it. Against magnificent backdrops, the characters play at little intrigues and scandals. They cheat at cards and marriage, they fight ridiculous duels, they’re at their most appealing when they’re childish. This is a film with a backdrop of a war that engulfed Europe, and it hardly seems to think human events are worth the effort needed to scrutinize them. By placing such little characters on such a big stage, by forcing our detachment from them, Kubrick supplies a philosophical position just as clearly as if he’d put speeches in his character’s mouths. Some people find “Barry Lyndon” a fascinating, if cold, exercise in masterful filmmaking; others find it a terrific bore. I have little sympathy for the second opinion; how can anyone be bored by such an audacious film, unless they’ve become such passive filmgoers that no movie can involve them unless it caters to them? “Barry Lyndon” isn’t a great success, and it’s not a great entertainment, but it’s a great example of directorial vision: Kubrick saying he’s going to make this material function as an illustration of the way he sees the world.